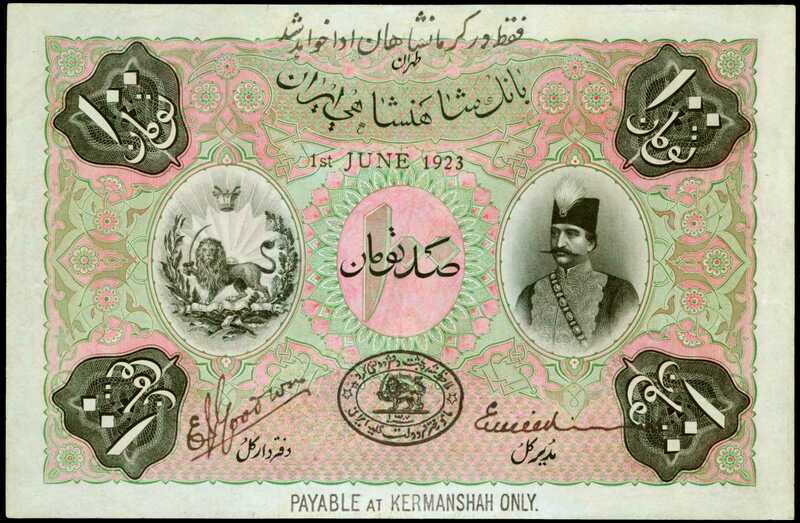 1923年伊朗波斯帝国银行100元。Established in 1889, the Imperial Bank of Persia was Irans first attempt of establish a modern banking system. Seventeen years earlier, a Baron named Julius de Reuter signed an agreement with the Iranian Government in Tehran that granted him permission to start a bank or establishment of credit if the government ever decided to allow anyone to do so. Red tape and opposition by many different agencies caused this to take quite a bit of time. Eventually a royal charter was issued in September 1889 authorizing the establishment of the first bank, but with many restrictions including: a mandate that all branches be located within Iran, that the board of directors had to be in London, and that more than 50% of the capital had to be issued in the United Kingdom. Ultimately this made the Imperial Bank of Persia an exclusively British bank even though Iran was not a British colony. Reza Shah Pahlavi took control of the country when he was selected as Prime Minister of Iran in 1923. The desire for Iran to have full control of their banking system was the beginning of the end for the Imperial Bank of Persia. The banks ability to issue notes was taken away in 1932. Many of the notes were destroyed over time by the Imperial Bank of Persia. Of the issued notes sent into circulation, only 236 of the 50 Tomans, and 153 of the 100 Tomans remain that were not destroyed by the government; surviving only because they were either stolen or never returned to be destroyed. The last known accounting of these numbers was in 1931, so it is likely that those numbers have since decreased dramatically, with just a handful or less surviving.WBG Very Fine Choice 35 Qualified. Pinholes, Probable Restoration.From the Prestigious Collection of Dr. Magid Al-Kimawi.